I love carrot cake but it’s really rich and I don’t eat it often now. Usually even when I do, I just have a couple bites. I like the flavor combination of it with the carrots, cream cheese, vanilla. Some variations even have raisins (bleh!) or coconut (I can deal). I’ve made carrot cake muffins in the past and they turned really moist. 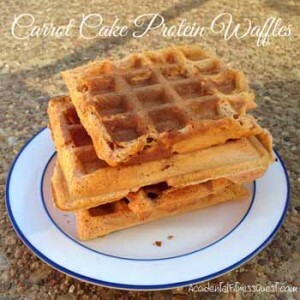 The other day I made carrot cake protein waffles. That way I could enjoy the spicy carrot flavor without all the overpowering sweetness, and who doesn’t love a waffle. Am I right? Mix all of the ingredients in a blender or Magic Bullet. You may need to add a bit of water to get batter consistency. Cook according to waffle maker directions. Makes about 4 waffles at approximately 267 calories for the whole batch – 31g protein, 20g carbs, and 7g fat. Since you’re blending this, you could use cut up cooked carrots instead of baby food. It will all blend up well together. I just had a couple jars of baby food carrots that I bought for another purpose. I saw them and figured, why not. I had my waffles with a little bit of syrup, but you can get really wild with your toppings. Bananas, peanut butter, greek yogurt, cream cheese icing.